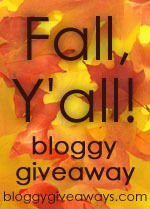 I just cannot resist participating in the Fall Y’all giveaway extravaganza. I had resigned myself to just “watching” since my favorite potter is low on inventory right now, but it has been so fun to see what everyone is giving away. I decided it would be a good time to go ahead and pass along my copy of The Toddler’s Busy Book by Trish Kuffner. This book is full of great ideas for entertaining your little one. So if you have a toddler in your life, and the long winter days are looming ahead of you, just leave me a comment and I will pick a lucky recipient of this little lifesaver this Saturday. Have fun at the giveaway extravaganza! I haven’t made it to the end of the list yet. Don’t forget…MamaLady is collecting birth stories for her new carnival on November 9. Friday night update: I will close comments and draw a winner “when I get up tomorrow morning.” How’s that for scientific? MamaLady is collecting birth stories for her new carnival on November 9. I had been working on mine since Toni posted hers. I’m posting mine early to get you in the mood to read and inspired to work on one if you have never written yours. Maybe I’ll even have time to get my son’s done now before the carnival starts. Over and over again, I repeated these mantras during the last days of pregnancy, trying to undo a lifetime’s worth of worrying about this moment. It’s no wonder that uncertainty ruled that day, Sunday, January 7, 2001, as I crossed the threshhold into church and felt that tiny “pop!” followed by only a drop or two of liquid. This can’t be what it’s like when your water breaks, can it? Must be A. pressing on my bladder. Must be false labor again. We called you A. ever since you were 20 weeks old inside my womb. I needed to start getting to know you, letting myself know that you were real. A. was about the only name your father and I agreed on, and it means [I’m not telling; it’s a secret! ], which I was absolutely sure you would be. I had no conception of what I would be like as a mother, having always been the youngest — doted on and cared for by everyone else. After a day spent wet and wondering, we called the doctor’s office. The one doctor I felt the least connection with (of course), after chastising us for not calling sooner, told us to come in and get checked. We loaded up the already packed bag and started the 40-minute drive to the hospital. “I’ve just gotten used to caring for this baby inside of me,” I think. I’m not sure I’m ready for you to come out. But the doctor said you must come out — and soon, to minimize the risk of infection, since I had indeed been leaking amniotic fluid all day. Doctor M. wanted to induce in order to deliver you within 24 hours of the time my water broke. They gave me an incredibly tiny dose of Pitocin (tiny at my request), and my body went right into labor now that it had permission from someone. I remember after about an hour of this, my water really broke like I thought it should — in one big satisfying gush. When the Pitocin-induced contractions came crashing on me in unrelenting waves, I very sensibly decided to try an epidural. (There was no chance at being ‘all natural’ once Pitocin was brought onto the scene.) I am learning to go with the flow. Daddy played Chant for me while you made your way out of one world and into the next. Our anesthesiologist was most pleased, since he was Greek Orthodox. 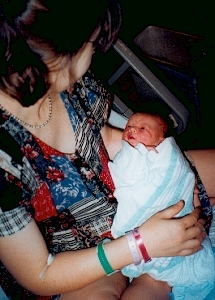 Your labor nurse, Tanya, said it was the most peaceful birth she had ever seen. We even napped awhile after the epidural kicked in. Tanya woke us up when it was time to push. It took about an hour-and-a-half for me to push you out. There would be no turning back now. When your pretty head and tiny body emerged, your daddy cut the umbilical cord. You were so tiny and pretty, with your rosebud mouth and delicate little fingers. You let yourself be willingly admired by the parade of grandparents, aunts, uncles, and cousins who came to meet and hold you in the days following your birth. When it was time to take you home, I was sure that the train we could hear from our house would wake you, but you didn’t flinch. I realized you had been listening to it for the last 40 weeks. Pow, our whippet, sniffed your tiny head, sniffed me, and curled right up beside us in snuggle dog position. He knew you too. And I settled in to begin learning to inhabit that promised land at the very edges of my own desires and my own expectations, where all the best things are. Thank you for coming to live there with us. Humility is not about convincing ourselves or others that we are unattractive or incompetent. It is not about ‘beating ourselves up’ or trying to make ourselves nothing. If God wanted to make us nothing, he could have done it. Humility has to do with submitted willingness. It involves a healthy self-forgetfulness. We will know we have begun to make progress in humility when we find that we get so enabled by the Holy Spirit to live in the moment that we cease to be preoccupied with ourselves , one way or the other. When we are with others, we are truly with them, not wondering how they can be of benefit to us. Indeed, humility involves a Copernican revolution of the soul, the realization that the universe does not revolve around us. Humility always brings a kind of relief. Who has a face like Brad Pitt and feet like Fred Flintstone? Oh, yes! It’s true. I guess this is what the humble me looks like! The best thing about middle age so far is that it I’m forced one to look away from my bulging middle, and all of my other imperfections that have not gone away in the last 39 years, to see what God has done and is doing for me. I like the view much better. Now that’s MY kind of mid-life crisis. The Moon at Sincerely Anna — Anna could use your prayers as the details of her second adoption unfold. Hidden Treasure at Rocks in My Dryer — You need to listen to this song. Wandering towards my own Canaan at Big Mama’s — She hit this one out of the park. Adjustments, Part 512 at Planet Nomad (Hat tip to Antique Mommy) — What is real? What is abundance? What are we about? You bold all the things that you’ve done. Let me know if you play along. Bad Mom, this one’s got you written all over it. 04. Taken a Ferrari for a test drive – This had actually never occurred to me. Hmmm. 11. Visited Paris – This one’s worth doing more than once. 13. Stayed up all night long and saw the sun rise – It seems like I should have done this, but obviously the memory was not memorable so I’ll have to try it again. 16. Walked the stairs to the top of the leaning Tower of Pisa – Can you even do this one anymore?! Lucky thing it’s crossed of my list! 18. Touched an iceberg – Lettuce, yes. Antarctic, no. 21. Taken a trip in a hot air balloon – My daughter wants to do this one. 31. Screamed as loudly as you possibly can – We liked to call this ‘keening’ in college. Fabulous stress reliever. 34. Ridden a roller coaster – Really best for the young’uns. 40. Visited all 50 states – Almost. Just need to hit Alaska, Hawaii, and visit some of you guys in the Pacific Northwest. 43. Danced with a stranger in a foreign country – Again, possible, but not memorable. 46. Backpacked in Europe – I think I missed out on this one. I’d rather travel a little more elegantly these days. 61. Gone scuba diving – Snorkeling, yes. Scuba, no. 65. Gone to a drive-in theater – Again, seems like I should have done this. But there is a GREAT one nearby for next summer. 111. Helped an animal give birth – My cat had kittens when I was young, but I don’t think I actually helped. 147. Been a DJ – Oh yes. WPLS. The Pulse of Furman University. Check! “Last Time” is my antidote to the “Do Agains” of the terrible twos and beyond. Granted, hearing that tiny giggle IS irresistible, but how many times can one adult shout “Boo!” before the thrill is gone? When I am on my last nerve, I sweetly sing out, “Last Time!” — giving my darling toddler the warning that he needs to end the fun gracefully. Go on, try it — and bow out of playtime, gracefully, while you still have a shred of your sanity. 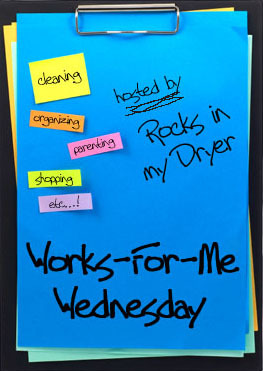 For more tips and tricks, visit Shannon at Rocks in my Dryer.